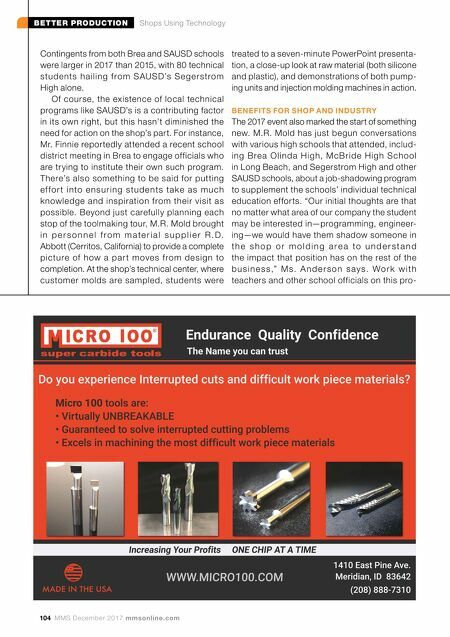 BETTER PRODUCTION Shops Using Technology mmsonline.com December 2017 MMS 105 posal will begin in earnest after the first of the year, she says. M.R. Mold's enthusiasm for workforce devel- opment hasn't gone unnoticed by peers. For instance, a $1,000 grant from the American Mold Builders Association (AMBA) helped cover the cost of bussing students from area high schools. Manufacturing Day also marked the launch of t h e A M B A's E d u c a t i o n a l O u t r e a c h A w a r d , in which three individu- als from member com- panie s, including Mr. Finnie, were honored with the opportunity to award scholarships to educational programs of their choice. F o r h i s p a r t , M r. Finnie has long consid- ered himself an ambas- sador for the industry. For example, he's been k n o w n t o s h a r e h i s knowledge among pro- cessors and competi- to r s a l i ke i n s i l i c o n e elastomers classes at the University of Wis- consin-Milwaukee, Penn S t a te U n i ve r s i t y a n d A k ro n U n i ve r s i t y. H e views such activities as par ticularly impor tant in a field like LSR tool- ing, which must be con- structed differently than more common plastic injection molds. "If we're going to keep manufac- t u r i n g i n t h e U n i t e d S t a t e s , t h e i n d u s t r y needs to be educated," he says. Based on the shop's M a n u f a c t u r i n g D a y efforts this year, his pas- sion has not waned. 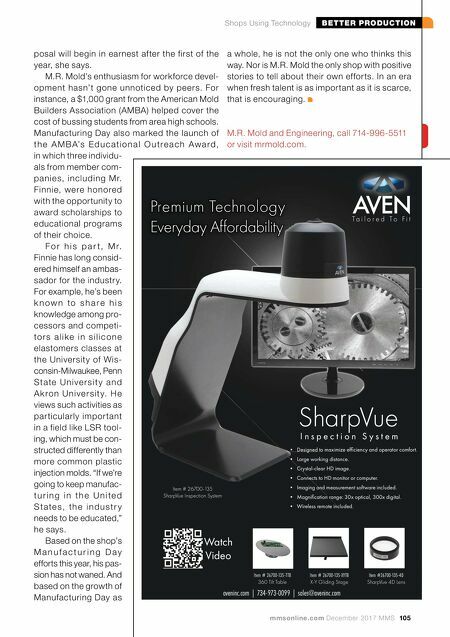 And based on the growth of Manufacturing Day as SharpVue T a i l o r e d T o F i t • Designed to maximize efficiency and operator comfort. • Large working distance. • Crystal-clear HD image. • Connects to HD monitor or computer. • Imaging and measurement software included. • Magnification range: 30x optical, 300x digital. • Wireless remote included. Premium Technology Everyday Affordability I n s p e c t i o n S y s t e m Item # 26700-135-TTB 360 Tilt Table Item # 26700-135-XYTB X-Y Gliding Stage Item #26700-135-4D SharpVue 4D Lens Item # 26700-135 SharpVue Inspection System Watch Video aveninc.com | 734-973-0099 | sales@aveninc.com a whole, he is not the only one who thinks this way. Nor is M.R. Mold the only shop with positive stories to tell about their own efforts. In an era when fresh talent is as important as it is scarce, that is encouraging. M.R. Mold and Engineering, call 714-996-5511 or visit mrmold.com.